In teaching my children nagenokata I am placing the primary emphasis on ukemi and the role of uke, with tori's role being that of a spotter. 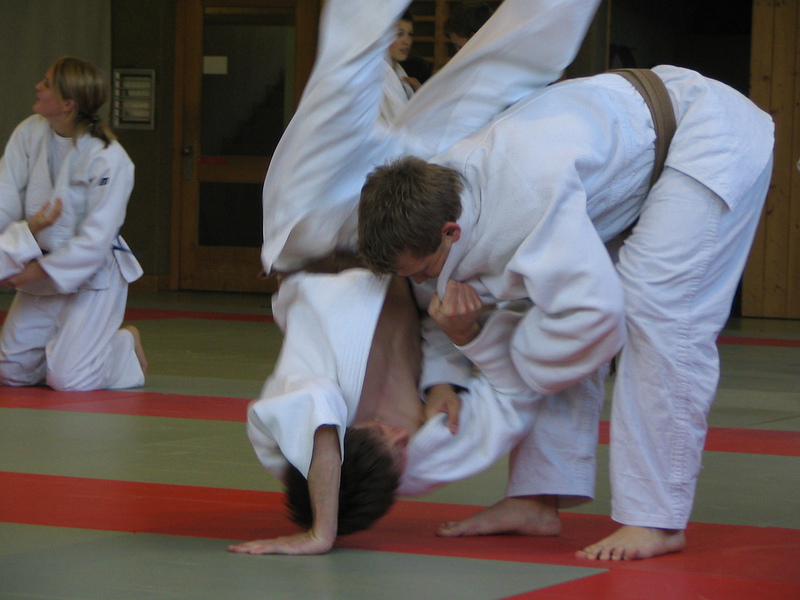 The second tewaza (hand technique) of nagenokata is seoinage done from a vertical overhead strike. Tori deflects the blow, turns in, and executes seoinage. In our uke-centric nagenokata with the kids I'm building up seoinage in a few different ways. as rolling drills. We start out having tori (the spotter) kneel on all fours and uke slides over their back to land on their side. This not only simulates the type of fall that uke will be taking, but it starts teaching the spotter to be strong and stable underneath of uke. If the spotter is much smaller than the uke then instead of sliding weight over them, they can gently balance across their back for a second or two (with coach thumping tori on the belly reminding them to be strong), then uke gets off of them. This way the spotter can begin developing the strength and form needed. as uchikomi. After both uke and tori are goot at the rolling drills, we have uke (the faller) take a position with right foot forward, weight loaded onto it, with the right arm extended as if in the middle of the downward strike. From here, tori can begin learning to deflect the blow and turn into the proper place to lift uke. Uke is also learning to prop with his free hand on tori's hip (the closed-gate effect) and to straighten out and balance (as in junokata). After lifting uke for a few seconds, tori sets uke back on his feet. as the actual technique - mostly. At this point the uke can enter in motion and tori can deflect, pick uke up, and stand strong as uke demonstrates his ability to close the gate, straighten out, ooze over tori's hip and land properly (with tori's help). This is very similar to the actual form of nagenokata, though it is easier to control this and slow it down if tori enters with a full hip-across position instead of making it the dynamic, true hand throw of nagenokata.